Years ago I can remember stories up in Taos, New Mexico about Cryptids called Werewolves and Dogman. I can’t say for sure that Werewolves are Cryptids because they seem to be darker in nature, half animal and half human. Are humans Cryptids, obviously not. The Taos Mountain in many ways became my enchanted forest, the mystery of not only my soul but also that which I couldn’t see but feel. My first Vision Quest happened up in the back mountains of Taos when I was 23. The three day Vision Quest started with prayers and a peaceful repose that lingered within my heart through out the days and nights of mediation. The ending though, was far from serene, more like the scene out of a scary movie. The difference is this really happened and it happened to me. I have always felt that trees can hide people from danger, if only they are asked to do so. The trees seemed to shelter me and I felt I was hidden away in my private world of mediation. With the trees as my allies I had a false sense of protection. They after all can only do so much from their high vantage points but I was to find out, they have other ways of at least warning people of possible danger. Lying down in my tent, I noticed that I had goosebumps on my arms and then I sat up and felt the hair on the back of my neck stand up. The dead silence of panic was deafening along with the startling angst in my chest. The dead silence alerted my warning bells and they started to chime unabashedly. The beautiful night’s tranquility had been shattered within the blink of an eye. It seemed the trees started to creek and moan loudly, waving at me, seemingly throwing branches at my tent. I scrambled out of my tent and started running without a second thought. The moon was full and high within the darkened night sky yet her luminous glow was my beacon leading me in the direction of my family’s campground. With the speed of a scared rabbit, I jumped over sagebrush and knew that even one glance back would be my downfall. I could hear breathing from far behind me with a slight growl escaping its jaws besides sagebrush and rocks being scattered and trampled. I was running as fast as my feet allowed me and in some strange way, I knew that if I didn’t pick up my pace, I was a gonner. Somehow I just went for it, an all out run, yet this thing was getting closer and closer. I could feel its gaze, penetrating my back, that of an angry predator. To put it bluntly, I felt like a deer or antelope escaping for my life. Somehow my superhuman powers took over and I sprinted home with a speed I didn’t know I was capable of. I ran into the bus and slammed the door behind me. I could tell it had stopped chasing me a couple yards away. The horses started to get panicky and the dogs growled. Let’s just say I woke up the whole camp, humans and animals alike. That night, I realized that I was just out of harm’s way by seemingly an arm’s length. That night I was lucky that the Werewolf backed off. Every once in a blue moon I would think about Loekey and then zone out, filling my days with the constant mundane certainty of being housemaid, animal keeper, Girl Friday and time clock Mom. Life can become a rerun that doesn’t require any forethought but to tell you the truth, for someone like me, it’s actually a comforting lifestyle. Normalcy is an understatement in our home because as an impath, sometimes wayward spirits like to continue discussions by attaching themselves to me as I head home. Sometimes it’s hard to remember to leave uninvited guests at my doorstep. Loekey was different though. To me, he was more then an inquisitive or needy spirit, he was a highly evolved being that represented the Sentient Forests and their mysteries. In some ways, Loekey’s energy reminded me of an old, antiquated Child’s story. You know, the ones we all grew up with, the Enchanted Forests of old, with Fairies, dragons and unicorns. I knew it was just a matter of time before Loekey would contact me again. I wasn’t worried about our next chance meeting but I have to say, I really didn’t want another conversation in the shower. I guess the human (woman) in me just felt like I was at a disadvantage being naked. As I found out later, Loekey on the other hand thought I would be more comfortable this way. Boy, does he have a lot to learn about humans, especially women! Months came and went and still no Loekey. August was an especially busy month not only because my daughter went back to school but because she turned 20. Needless to say, by the end of the month I was ready for a vacation. Michael and I decided to take a short trip to Oregon, on Labor Day weekend. It was a great change of pace for both of us and I was really looking forward to seeing the countryside. We stayed in Portland with Michael’s daughter and her fiancé and ventured out in our rental car during the day. On our first day, we were blessed to have Michael’s oldest daughter with us so we drove all around wine country and back roads. We saw Christmas tree farms along with groups of huge pine trees. The forests were thick with undergrowth and the smell was the best part, it has never left me. The second night of our vacation, we settled down to go to bed and for some reason I could not fall asleep. I tossed and I turned and I found that I was really dry and thirsty so I got up to drink some water. I put a few water bottles on a side table that was in front of the closet. We moved it there to give us more room by the bed. I drank a whole water bottle and still felt dry. I usually drink a lot of water at night but what made this really weird, I drank more water then usual that night because I felt like a dried up ole pine tree. I knew I really needed to get some sleep since it was after midnight so I turned off the light and got back into bed. I laid down and turned to my left side facing the outside of the bed. As I lay trying to get comfortable, I got the sensation that there was a huge figure standing by the door-frame inside the room. I thought I was just imagining it but I could clearly see the outline of a large figure standing, facing me. I said quietly to myself that if there really was someone there, to make a sound. Just as I said that, two of the water bottles that I drank from, popped in sequence very loudly. As a matter of fact, so loud that I knew they probably woke up Michael but to my astonishment, he was still asleep. That’s when Loekey said hello and told me not be scared. I must admit my heart was pounding a mile a minute and I was very intimidated by his large frame. His head was right up against the ceiling and I could see a leather strap across his chest. He talked to me for what seemed like minutes but I had the impression that it was more like hours. All I know is that by the time I did fall asleep, I was no longer intimidated by Loekey and I felt very comfortable in his presence. It was evident that Loekey had given me quite a bit of information but I was too tired to do anything but sleep. Michael and I were talking a couple of days ago about something that all experiencers, abductees, researchers and family members go through and that is trying to figure out who the “others” are. I was talking to him about who I thought they were but more importantly I mentioned that if you look carefully enough, you can get glimpses of who the “others” are by looking between the lines of documented and recorded testimony of the very people affected by them. The “others” are vague and blurry but only because they don’t have the courage to show themselves directly in front of those they target. The “others” can have large hands especially to a child leading to the conclusion that those large hands belong to a full grown adult. The hands can also be very different from a humans; delicate, long and cold making the experiencer feel they are part of something unworldly, fictional yet real. The “others” have a smell to them, a kind of calling card that alarms the senses first, rousing the mind to full alert. There’s electricity in the air just before they arrive, you can smell either wires burning or a pungent odor of dampness combined with an electrical charge that fills the lungs making every breath unnatural and forced. Humans masquerading in uniforms and boots, speaking in codes along with the clinking of metal are a human designed and operated form of the “others”. Compassion with this group, can be nonexistent or a brutal retaliation. The “others” are known as bright lights in the sky, windows or bedrooms with telepathic messages that dull the senses enough so that a levitated body flows with ease. The memories become hidden messages forgotten by a manipulated mind. The “others” are nightmares and dreaded sunsets that seem to overwhelm agitated nerves. The “others” smile with a cold reassurance that all will be okay, yet deep down within the soul the truth speaks differently. 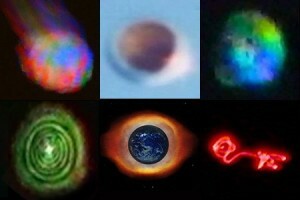 The “others” can be pure energy like a plasma photon vehicle or spheres that are shaped like orbs or shooting stars. They can go through thoughts and fears without so much a glance. The “others” can be dark windowless eyes that are like an endless hallway into a dark void, empty and hostile. These eyes seem to capture the mind and cage it in frightening images of consequences. And yes, the “others” can be smiling faces with genuine intentions that help us become better humans. It really just comes down to which of the “others” we encounter throughout our lives. So tell us, what are the “others” to you? These two additions from my diary have always stayed with me through out the years. I decided to share them because I think people need to know that there have been visitors coming here for many years. I feel if people need proof at this point in history then they really are living with their heads in the sand. We all instinctively know what is the truth. In today’s day and age, people are accustom to bury the truth deep within them. The more technology, the more foreign our higher-selves become to us. The Men in Black memory, is one of many. The Alien-Men in Black taught me when I was a little girl so I tend to have a love-hate relationship with them. The government, Men in Black are just agents who take on the appearance of the initial Men in Black. The only similarity they have is the way they dress, beyond that there is no comparison. I was invited as a special guest to visit a spacecraft that was positioned close to earth. The human looking visitors were familiar with earth and they often came to visit us from what I was told. I was standing in an unusually shaped spacecraft that served like a classroom of sorts for various types of curriculum’s being taught to these visitors kids. We were all in very tight corridors so I knew it was a small spacecraft that operated more like a transportation vehicle. I was walking around many children who looked just like children on earth. I had the feeling that the mothership they came from was massive and not far away, though I can’t recall seeing it, I had more a feeling it was not far away. The children seemed to move at a faster speed then me and my mind had a difficult time slowing them down. They were highly intelligent and they obviously exuded a higher frequency then me. A little girl came over to me and started to excitedly talk to me but she was giving me a really bad headache. I immediately felt dizzy as she focused all her attention on me. Her speech sounded like it was on fast forward and I couldn’t keep up with what she was saying. She was around 9 or 10 and her brain function was so much higher then mine and I could tell she didn’t understand why I couldn’t understand her. She assumed because I looked like her that I was just like her. I came back from this experience very humbled because the children were just so much more intelligent then not only our kids but most adults here. I remember the hostess telling me that they learn at a very fast rate. In a silly way I almost wished that some of their intelligence would have rubbed off on me. I knew I was human and without a doubt that just wasn’t going to happen. The year of this experience wasn’t written down but I believe I was in my late 30’s. The first thing I remember was that I was tied down by my wrists and ankles to a large chair that made me look like I was a small child. It reminded me of the electric chairs in years past that they used in prisons. This one must have been for very large people. There were two Men in Black standing in front of me by a doorway. They weren’t the white skinned Alien type but government agents. None the less, they were dressed completely in black, including sunglasses. I really didn’t like them and my animosity was growing because they seemed to be making fun of me. I lunged forward trying to get at them and realized I was tied down by my wrists and ankles. A voice from behind me told me to look at my right palm. My wrist was untied and for a minute I thought maybe I could untie myself. The voice told me to take my right palm and place it over a long, pointed needle that was about a foot long and pyramid shaped. I immediately felt uncomfortable and I told the voice emphatically, “No,” and then said they couldn’t make me. The two Men in Black started to laugh and I again instinctively lunged at them which made them laugh even harder. The voice told me again to place my palm over the needle and I again said “No!” All of a sudden my right arm moved on it’s own which was the weirdest feeling I have ever felt and I immediately knew I couldn’t stop it. I watched as my right palm moved over the sharp point of the long needle and no matter how much I focused, I couldn’t stop my right palm from being pricked by the needle. I blacked out as soon as I felt the tip of the needle prick my palm. I believe the purpose of the chair was to intimidate me and make me feel like a small child. What I can say is because of the experience, I realized that I acquired a different kind of perception, almost like my frequency was altered, more sensitive. I saw no cut or prick on my right palm after I remembered the experience happened. There were no marks on my wrists or ankles. My palm in no way felt sore or showed any signs of being messed with. I was agitated beyond belief though, and I honestly think I could have taken those Men in Black on and beat the crap out of them. Loekey said that the portals are upside down pyramids. The point of the pyramid gains its energy from Middle Earth. Each natural portal has a drop off point that has a timing to it. He said that any topography around the portals would give off a distinctive vibration that would affect the senses for anyone within its perimeter. It would feel as if there was a morphed or skewed altering of time. Visually he said it looks like colors come from all directions and the depth perception of anything within the portal is distorted, almost stretched. Loekey said that the natural portals affect areas around them within a mile of each direction, that includes up above (the sky) and down below going towards Earths center. At certain times of the day or night the natural portals rotate and the octagon pattern shifts. This is because Mother Earth adjusts for anything that is going in or coming out of the portals. He said, the important aspect of the portals is that when the pyramids are pulling towards Middle Earth, this very action helps the Earth rotate. If an artificial portal is made, this changes the timing of the “natural” portals rotating. For instance, if Aliens rip through or open up a portal either dimensionally or galactically, this is not good for the planet. The fabric of time and space has to come from the composition of the original source meaning that the energy and frequency has a pulse that is like a blue print. All beings who are natural portal jumpers have within their DNA, Earth’s blue print. This means that if anything happens to the rotation of the portals, it can affect the portal jumpers biologically in a bad way especially if they are in the portals at the same time another artificial portal is ripping through Earth’s atmosphere. I can only assume the octagon and the multiple pyramids can’t function properly with the artificial rip or pull coming from an outside source other then Earth. Loekey was saying that the species called Dog Man is being affected not only by these artificial portals but by the changes within the Earth’s environment. Dog Man’s ability to sense where the natural portals are, offers other beings a type of road marker, an essential chart in and out of the portals. At this point he said it is just a matter of time before Dog Man chooses another dimensional planet to live on. If this happens then he suspects that it will be hard for portal jumpers to know where the natural portals are versus the artificial ones. Loekey said that each Earth Keeper has different duties and Dog Man’s is essential for the portals rotation of the octagon pattern. He said that when the Dog Man species go in and out of the portals, they fine tune the Earth’s rotation so that it stays at a specific velocity. It’s important to note that the artificial portals allow other dimensional beings in that otherwise could not come through the natural portals. Unfortunately, because most of the artificial portals have not been closed off, we now have problems with biological beings called “bioinerts,” who otherwise can not come to Earth without the help of the artificial portals. They are like parasites and Loekey said they are very dangerous and destructive. He said that some of the bioinerts are a problem for them as well so humans aren’t the only ones who have to defend themselves. Unfortunately the artificial portals and the “bioinerts” combined affect the natural process and encoding that Mother Earth goes through for the natural portals. The question at this point is how to close off the artificial portals once they open up. Since the artificial portals are dangerous to jump into…there is no way to know how to close them off from their point of origin. Given that the artificial portals are foreign to Earth; their technology is also of unknown origin so it’s anybody’s guess how to close them off here. If Loekey or any of the numerous portal jumpers decide to take on such a dangerous mission and jump into the artificial portals, there is no way of knowing if any of them would survive the jump or come back to Earth. Loekey said they are now contemplating whether they will take on the task of closing off the artificial portals. 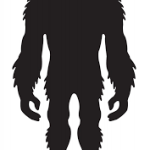 It must be made clear that I of all people would be the last and strangest pick for any Bigfoot to communicate with and give direct and crucial information to. I’ll be honest; I had no more interest in Bigfoot outside of enjoying the occasional videos and images taken by Sasquatch enthusiasts. Beyond that, forget it, I was interested in my search for those elusive and formidable Alien Abduction answers and resolutions. Such a quest leads many researchers into the abyss of dead ends, besides the occasional pot holes of doors closed or interviews canceled. This to say the least was the curve ball I never saw coming. February 21, 2014 was a morning like any other. While I was drinking my hot tea, I was checking out some interesting videos on YouTube and came across a channel called, Sylvanic Bigfoot that had really good images and information regarding Bigfoot. I watched a video and sat in awe of an amazing image of a supposed Bigfoot. I thought to myself, “You are so beautiful, just an amazing being.” I truly felt a profound warmth in my heart for the Bigfoot I was looking at and decided on the spot to subscribe to the channel. After that amazing experience, I decided it was time for my morning shower. I put on some Pandora music and I headed into the shower actually feeling pretty good and in high spirits. A few minutes into shampooing my hair, I heard a sound, almost like a deep underground boom. I turned the water off and listened…nothing more happened. I thought it was probably a car door slamming shut from outside and decided to turn the water back on. I looked around and thought at first it was the music coming from my bedroom. I didn’t think much more about it and continued to wash up when I heard the voice again. He said, “Yes, you heard me, my name is Loekey.” He then proceeded to spell his name out for me to make sure I understood how to spell it. I thought to myself, is he a Bigfoot or another spirit trying to communicate with me. Within an instant of that thought, I heard him say, “Yes, I am of the Sasquatch kind.” I immediately thought it was interesting how he didn’t say the name, Bigfoot. I felt a little vulnerable and wondered if he was looking at me…naked! I tried to put that thought out of my mind as quickly as it came. Obviously, I hastily finished my shower and got some clothes on.I then turned the music off and listened for Loekey’s voice but there was only silence. It was as if it never happened but I knew it did. After I dressed, I excitedly text my boyfriend, Michael and told him about the experience. He called me to get more details and was very excited for me. He is a big believer in Bigfoot besides having a lot of respect for them. Michael thought it was really funny when I told him that I heard Loekey’s voice in the shower. It was a bit strange for me but then I thought perhaps it was the fact that water was a conduit, a way for Loekey to communicate with me. That was all the communication from Loekey I received for many months. I thought for awhile that it must have been my imagination because it seemed so surreal and so long ago. of esoteric knowledge. I’ve read that this is rare but that throughout history this is the way it has always been done. In most esoteric belief systems it usually takes years of disciplined meditation, study, ritual or by other means advancing through a graduated system to attain this secret knowledge. For the chosen few, the circumstances are frequently described similarly: a light coming down from the sky, an entity materializes often with a vision or a message. In my case there was no immediate message but increasing peculiarities began to occur around me. In religion, esotericism and ufology the stories are similar. Beings of light or energy make contact. I’m comfortable accepting that this has happened to me. I also feel confident as to the reasons why. Why did I have these encounters, why directly, why more than one? I believe my mission is that of a channel, interpreter and writer. Some contactees have reported receiving information often about the future telepathically or through dreams. This is also the case with me as I often receive information that I couldn’t possibly have known. Deciphering often chaotic information by making seemingly random connections or by using intuitive extra sensory means is the trick. Deciding what should be revealed and how is another. It was several years later after my second encounter that I put it together after repeated psychic and other apparently supernatural incidents. The mounting number of inexplicable anomalies is what made me suspicious. It’s what drove me to my lengthy and in depth research ultimately into alien species. What I found was nothing less than astonishing and reinforced my suspicions about my encounter being an entity and the source of most of all the weirdness. First of all, the entity I saw in retrospect impressed me as God-like. It was an enormous multi-colored luminous cloud like object about a mile in width. It was a globular, slightly oval luminous plasma with about a dozen distinct but separate colors. 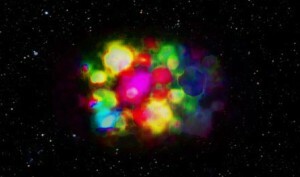 Each color was also globular, changing shape and size while adjacent colors would either contract or expand in response. The colors were bright, saturated and fluorescent in appearance like neon. The overall size never varied, it was completely silent, almost directly above me and I seemed perfectly centered from left to right, beneath it. Above: This is an actual public domain UFO photo I found online and altered with Photoshop to resemble what I saw. It’s almost exact but filled the sky a mile wide above me. After about 30 seconds, the thing just shot straight back and disappeared into a clear sky full of stars. Then after about ten seconds, it just as suddenly came back to the same exact position and size with all the colors in their exact same places. The speed was beyond belief, taking about a second to travel the distance. WOW! From a mile across to hundreds or even thousands of miles away in one second. It took no more than a second to return too. I remember thinking: “This is weird and I don’t think it’s from here” but here it was. So, how many alien species are interacting with our planet? Many scientists throw out different numbers, but there are many different types visiting. We humans are a humanoid class zero civilization on the Kardashev scale. Named after Nikolai Kardashev in 1964 with type one, two and three so we don’t yet rate. Then there are greys, nords, hybrids and sub-classes A, B, C and so on. When someone sees an extraterrestrial, they usually know what they saw could be nothing else. 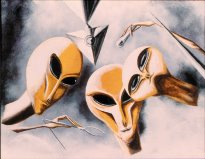 It’s easy for someone to say “I saw a grey humanoid or insect like being.” Many intelligent well educated people have reported seeing UFOs and others have encountered ETs. My first encounter was a humanoid and appeared as a child with dark blond hair. Yet my second one was a very large plasma and if it hadn’t been for my subsequent altered realities I may have never looked deeper. However, I did and what I found is that the “God species” is integrated throughout all the major human belief systems. Mythology, philosophy, science, religion, esotericism and ufology all make mention of them. 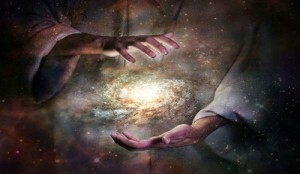 They have been here since before man and are often associated with creation theories. The Demiurge, Energy beings, Thought beings, Aeons, Angels, Deities, Archons and one of my favorites, the Watchers. Within the context of my definitions, they are not to be confused with the Nephilim. The Nephilim are usually defined as half human and even demonic. I don’t buy into that whole theory of UFOs being demonic illusions and trickery. The similarities are what connect them, and ufologists or ancient alien theorists recognize these associations. Key amongst the similarities are appearance and abilities. They are usually described as non-material entities existing outside of our material space time dimension. However they are able to materialize in our dimension as energy, light or other apparitions. They can also be completely invisible. They are highly evolved and don’t need a craft to travel. I call them the God species because of these things and their supernatural powers. Alien theorists believe that the angels from the bible and the Watchers from the book of Enoch were actually aliens. Philosophy, Gnosticism, Kabbalah, Esotericism, Ufology all describe these exact same entities using different names. For instance among different Gnostic sects or across belief systems they are allegorically similar. Archons and Archangels often play the same roles with the same powers. Pneumatic creators which some believe created the material world and man. It is believed that throughout history these entities have been and still are steering world events. They don’t act upon the lives of every human who encounters one just as every plasma sighting isn’t a Watcher. I believe mine was because of the numerous anomalous events that have since transpired. In my latest book there are many examples of what I was experiencing. It was as if my thoughts and written words were being monitored. My writing seemed to be being manipulated and emulated in the material world. For instance while I was writing about my encounter a storm hit. On that exact beach over thirty houses were destroyed with some being washed away but no other houses on any other beach in town. Those houses were there over a hundred years and no storm had ever occurred like that before in the history of CT. It seems strange that it happens during my lifetime while I’m writing about that exact beach? As I’m writing chapter after chapter similar macro synchronicities were occurring and I wrote about them as they happened. The types that were happening have to begin within what Physicist David Bohm called pre-space or the pre-existence process of material reality coming into being. Only a creator type entity can generate the pre-existence leading up to created scenarios of the multiple synchronicities I’ve been experiencing. I can imagine that only an entity having god-like powers would have these capabilities. The entities know what’s going to happen before it happens because some human’s timelines are being controlled. From what I understand many people have reported lingering or permanent altered realities after ET encounters. Increases in paranormal activity, increases in synchronicity, psi events and so on. I will continue to research, learn and write about this species in much more detail and will share this knowledge as I do. For our first meeting of the New Mexico UFO/Paranormal forum version 2015, we had this wonderful guy named Richard Smith. Richard is an artist, teacher, writer, musician, alien Contactee, and public speaker. He skillfully blends mainstream history with past, present, and maybe future Alien history. Richard has a unique view of Alien presence on this planet and how they have shaped and controlled all of our reality. Richard speaks the truth and justice of our real reality and history. Some embrace him and other maybe frightened by him. He speaks on why our world politicians are, seemingly, the puppets on tightly held string. Richard talked about these various groups who have been in control since the beginning of time. They include, but are not limited to, the Elite Reptilian Queens, the Greys, the Sisterhood, Dogman, and Sasquatch. Only Sasquatch got high marks as protector of the planet. Smith talks of the Gene of Passion, which is something the bad guys want to suppress in Mankind. This Gene gives humans the power and creativity to resist the ways of the Darkness. The Darkness that has dominated the earth for thousands of years and causes death and destruction on a huge scale. The lack of this Gene increases the powerful and brutal influence of the reptilian part of man’s brain. Thanks UFO teacher for sharing your education of our cosmology and how our words have so much more meaning and symbolism. For more on Richard Smith, the UFO Teacher, search for his on-line book-“Legions of light – Armies of Darkness. 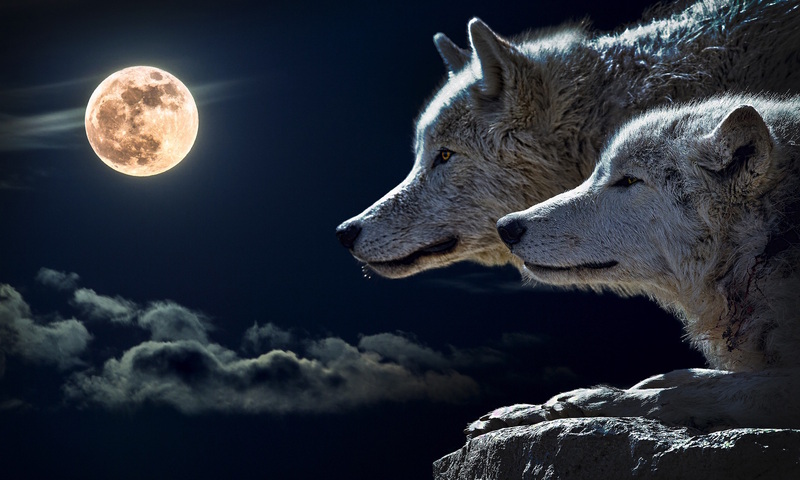 Sleep tight – for man has always found his way to keep Darkness at bay, but we now need to illuminate what Reality could be, if we were fearless. As I have stated in the past, I have been researching UFO-related subjects for over 45 years. And after 45 years I am just starting to connect the dots. It has taken a long time to come to some of these theoretical conclusions. The first conclusion is–the saying –“we are not alone” is a major understatement. We here on earth are surrounded by several hundred different types of beings, most of which are of a multidimensionals origin. In a short period of time, I have photographed at least 50 different ones. And from other conversations over the years with contactees and abductees there is probably 150 various types to be discovered–hopefully through my vortex photography. (On this site go to search in the upper right corner and put in ‘’Vortex,” and you will see some of the 50 beings). Second conclusion is–33% to 40% of everyone in the USA has had some kind of contact with these inter-dimensional beings. This conclusion comes from the hundreds of random people I have come in contact with over my 63 years of life. Remember, most of these experiencers have only a vague remembrance of their experiences, but as time goes on, their memories will get stronger and stronger as the dots start connecting. Third conclusion is–50% to 60% of the military personnel including their family have had alien being type encounters. It is sad and a little scary to think our government cannot prevent these encounters with their government military forces. Of course let’s hope the multidimensionals have a friendly agenda or the results of these large numbers of military contacts could endanger the basis existence of mankind if their agenda was evil. There will be more conclusions in Part 2. Sleep tight – Remember connecting the dots is just the beginning to understanding our real reality.